Dumneazu: The Lanzhou Restaurant in Budapest: China discovers the potato. The Lanzhou Restaurant in Budapest: China discovers the potato. There is no use complaining that Budapest doesn't offer much in the way of Chinese restaurants. There are tons of Chinese places, but by and large they are not that good - almost every intersection offers a small, cheap "Kinai Bufe" offering steam table staples of gluey orange sweet and sour pork, stir fried meat on mediocre rice, and spaghetti adapted into a brown, soy flavored noodle dish. Cheap chow to fill up the Magyar working class (remember the working class? Karl.... we're still waiting for that revolution you promised!) Most of these places are franchises offering the same menu, cooked by people who are not chefs. If you want real Chinese food, you are better off at the food stands at the Four Tigers Market. If you want to eat decent Chinese in Budapest while sitting down at a table with chairs, you will eventually wind up at the Lanzhou, a small Chinese joint located just off of busy Rákosi utca between Blaha Lujza tér and Keleti Train station. The Lanzhou serves hard-core, authentic Northern Chinese cuisine, which is a far cry from the Cantonese and Fukien style southern Chinese food that we eat in the US and in Western Europe. The reason is simple: Budapest doesn't have the economy to attract emmigrants from the better off regions of South China. Most of the Chinese here are involved in the export of cheap commercial goods via rail from Beijing and North China, and their cooking reflects the heartier noodle and dumpling traditions of a colder region. In most Budapest Chinese restaurants you might find all those classic Chinese dishes, but they are being cooked by Northerners, which is like ordering Sicilian food in a Norwegian resturant. Not a good idea. The Lanzhou, however, is one of those special "the Chinese eat there" eateries, and the cooks actually are trained in food and come from northern China. Often you can see a table of a dozen or more Chinese folks chowing down at Lanzhou, and it pays to watch how they eat. The Lanzhou is essentially a budget banquet resturant, the kind of place you take your friends or business colleagues out to for beer and food. The menu reflects this - there are about five pages of cold and hot appetizers before you even get to any entrees. The northern Chinese drill goes like this: the table orders a slew of small plates to nibble with beer (no rice is offered during this phase) and after a couple of hours of this, the table orders a few hot entrees with rice or noodles to finish the meal. 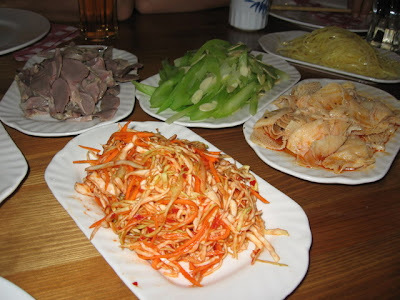 In the pic above we have spicy cabbage salad, gizzards, celery with garlic, and tripe dishes. My favorite, leaf tripe in spicy oil. 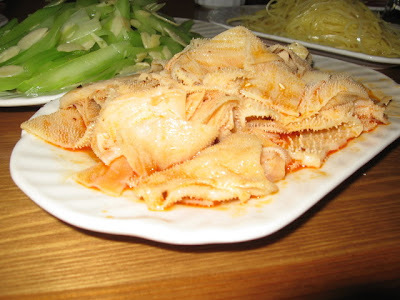 When Fumie goes out to Lanzhou with her Terrifying Girlfriend Posse, they order by rote and I never get to eat any of the stuff I like, such as tripe. (Judit actually has the menu memorized by the menu numbers of the dishes!) Or duck hearts in hot oil. Gizzards... maybe... (pic below) because Fumie likes them since they are cooked Asian style - stewed only to the point of crunchy doneness. Don't expect soft, long cooked innards here... The guts sing at Lanzhou. Another favorite of mine is the soy sauce cooked pigs ears... seen here in front of a plate of chinese siu-jiao dumplings. Hmmmm... crunchy ears! 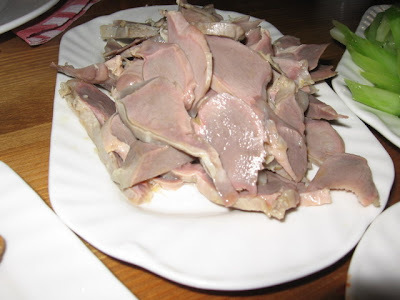 And the pork just keeps on coming... sliced pig belly in sesame oil... As befits a northern Chinese resto, the Lanzhou also offers a selection of Hui (chinese muslim) style dishes, albeit mostly on the Chinese language-only specials menu. 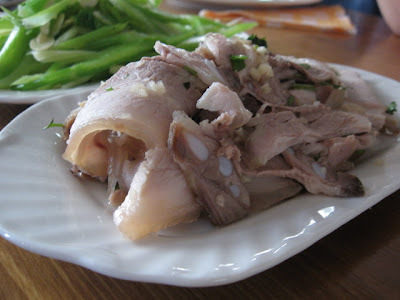 Hui dishes usually substitute mutton for pork. Lanzhou is also a region famous for its noodles, and the Lanzhou hand-pulls its own house noodles (the beef noodle soup is good) and also offers "shaved noodles" - a lump of noodle dough is sliced into primitive, longish strips and stir fried with mutton and veg. (These are listed back in the noodles section of the menu... ask the waiter) Another stand out dish is the Chinese "potato salad" (seen below.) This is something you don't find in Cantonese restauarants. 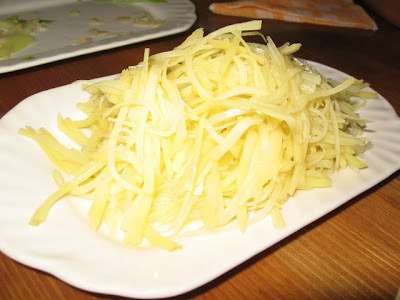 Thin sliced potato is flash boiled in hot water and then immediately rinsed in cold water, then dressed with sesame oil. Easily one of the most distinctive items on the menu, one dish is enough for two people, but not more unless you want to order another plate. 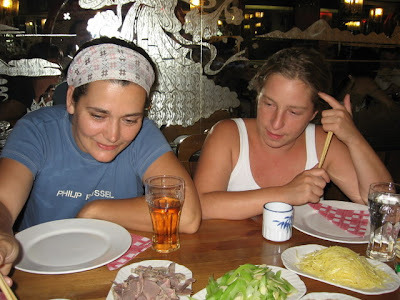 Members of the Terrifying Girl Posse studiously avoiding the plate of gizzards and going for dumplings. They look tough, but they really aren't. After a set of small dishes we usually order some spiced eggplant, hot and spicy lamb, and chinese fresh green vegtables, usually a plate of ku tsin tsai (water spinach) or cao tsai (bok choy) depending on what is in season - ask the very professional Hungarian waiters, who probably know more chinese kitchen vocabulary than anyone else in the Uralic world. Be aware, also, that if you order the whole fried fish you will get an authentically wok-fried whole... carp. Ok, maybe you like carp. Entirely authentic. Maybe that is what you wanted for dinner. Just sayin... One word of caution, however: by the end of the night there is the ...er... rice problem. A banquet style resturant doesn't usually give two hoots about the quality of its rice... rice is more of a ceremonial afterthought. Sometimes the rice here... has sucked after nine PM. Sorry, but true. So if you - like me - are dining with Rice Fascists, be warned. Or just fill up on noodles. Expect about FT 3500 per person. Google says Lanzhou is “permanently closed”. True?